Cambridge boss Richard Money has denied claims that he made "non-league" jibes towards Cheltenham counterpart Mark Yates during Tuesday's League Two game. The pair were both sent to the stands following a disagreement at half-time. 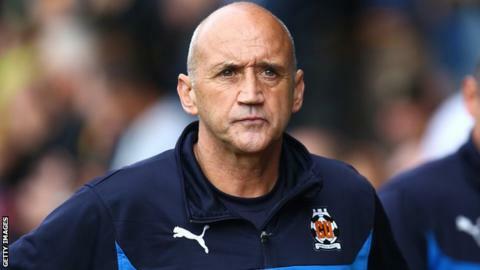 Yates claimed Money had called him a "non-league manager of a non-league club" but Money insists he was speaking about Yates' attitude towards the U's. "The reference to non-league was us. He missed two important words: that's us," Money told BBC Radio Cambridgeshire. "He showed us no respect - in the way he conducted himself and the way he spoke to us. "I can categorically say I would never disrespect a football club in the way it has been suggested." Yates suggested Money had called him "a non-league manager of a non-league club". The game at the Abbey Stadium finished 2-1 to Cheltenham after Terry Gornell's second-half winner. Despite disputing Yates' claims, Money, who led Cambridge to promotion from the Conference last season, accepted the incident outside the tunnel was unacceptable. "I let the team down. I got involved in something and it escalated," he said. "If it cost us the result then I've let the club down and the supporters. But we'll never know how much influence one can have. "When things like this happen you have to look at yourself. It hasn't been a very nice 36 hours because to get involved with something like this is ridiculous and unacceptable."